Brink Bionics - is developing bionic arms with machine learning that integrate with the human body and provides amputees with a more intuitive experience. CataLight - is making safe drinking water accessible for all by developing a new kind of water treatment solution. Pulse Industrial - is developing a smart monitoring system for steam traps to improve safety and reduce CO2 emissions. Intelline, which designs and manufactures affordable and scalable cryocoolers, enabling the widespread commercial use of superconductor-based technologies, copped the top hardware company prize of $10,000. 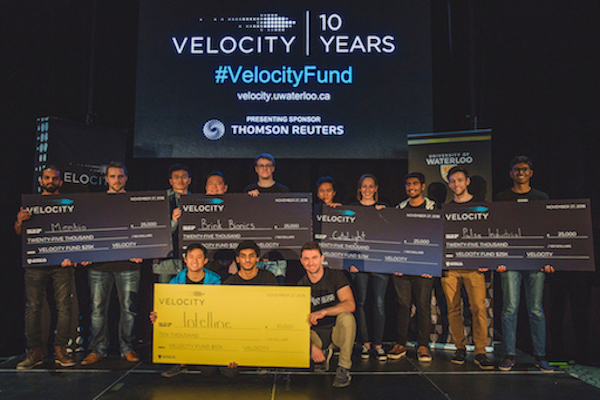 From left: Membio, Intelline, Brink Bionics, CataLight and Pulse Industrial pose with their cheques after winning the Velocity Fund Finals $25K competition and the top hardware company prize ($10K). All four winning VFF$25K startups took home an extra $5K in intellectual property services from local firm, PCK | Perry + Currier, and will receive mentorship and coaching from the Velocity Garage startup incubator. FEM in STEM was one of four early-stage Waterloo student-run startup winners in the Velocity $5K competition. Inspired by her experience in university, FEM in STEM’s founder, Mylene Tu, formed the company to encourage other females across Canada to develop careers in underrepresented industries. “I grew up in an area in Ontario where I didn’t have the exposure to all these opportunities. But then coming to the University of Waterloo and going to Toronto for co-op I saw how many opportunities actually existed and every time I left these networking events or conferences I left feeling inspired,” said Tu, who is a first-year Management Engineering student at Waterloo. 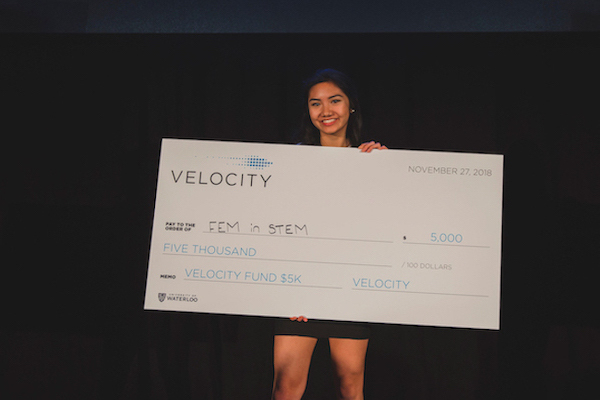 FEM in STEM’s founder, Mylene Tu, poses with her cheque for $5K at the Velocity Fund Finals. Material Futures Lab - uses bacteria to create natural, eco-friendly pigments for textile dyeing. Oleotech - is using oleophilic properties of fiber from waste tires to remove hydrocarbons in stormwater runoff. PriveHealth - a gamified cybersecurity training platform for healthcare professionals.